DAVINCI development A/S has entered Danish motorsport, where we have entered into collaboration with the Danish Thundersport Championship, for the development of bodywork for the motorsport series, based on high-end sports coupes. The development is centered around an Audi RS5 and a Mercedes AMG C63. A Chevrolet Camaro, which is one of the current DTC racers, is used as a reference. 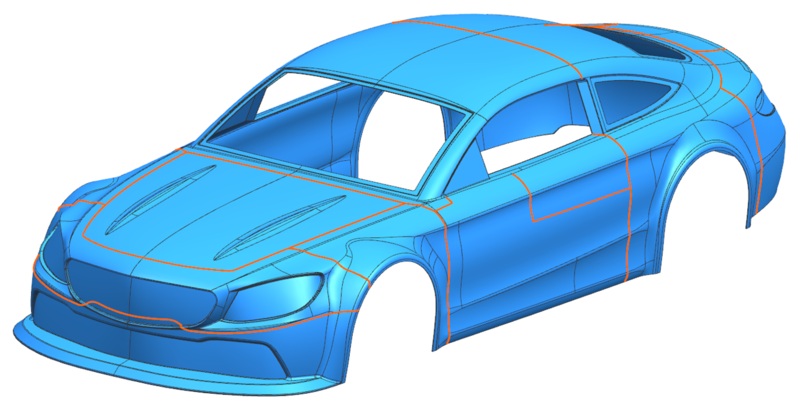 After the CFD analyses have shown largely identical drag- and downforce on the three cars, the next step is to prepare the production base for the manufacturing of the cars. 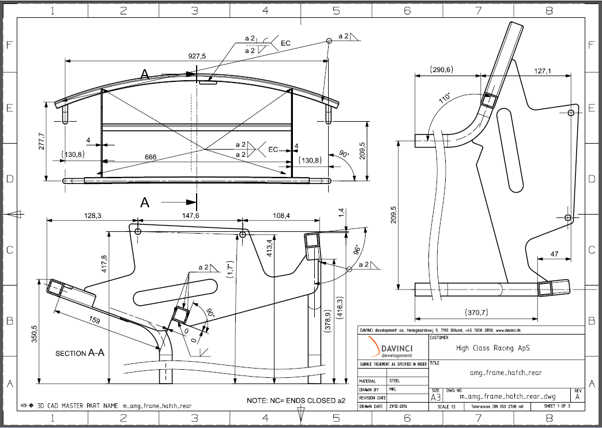 The production base includes STP files of the molds, 2D drawings and DXF files for the windows, 2D drawings of the brackets for mounting the chassis on the tubular structure, laminate descriptions and installation instructions. Together with the customer, it was decided that the chassis of each car would be split into 14 parts. This was done with regards to the manufacturing process, and the possibility to replace exposed parts both during and after a race. 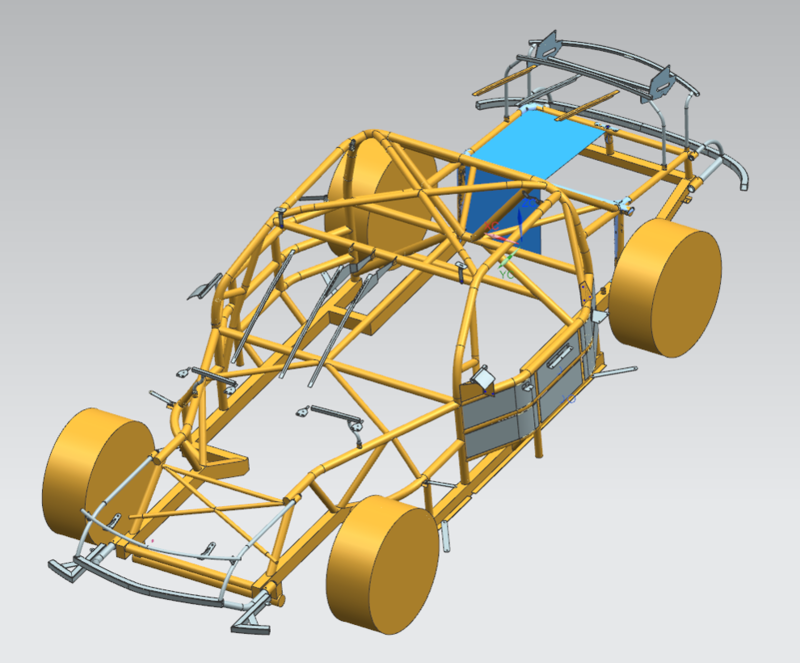 To start the process, the design of each chassis is split into 14 parts in the CAD program, NX. 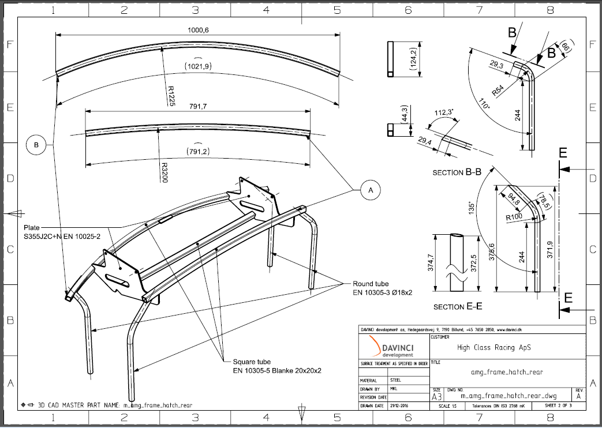 Hereafter, a CAD file is created for each part, as the basis for the mold. 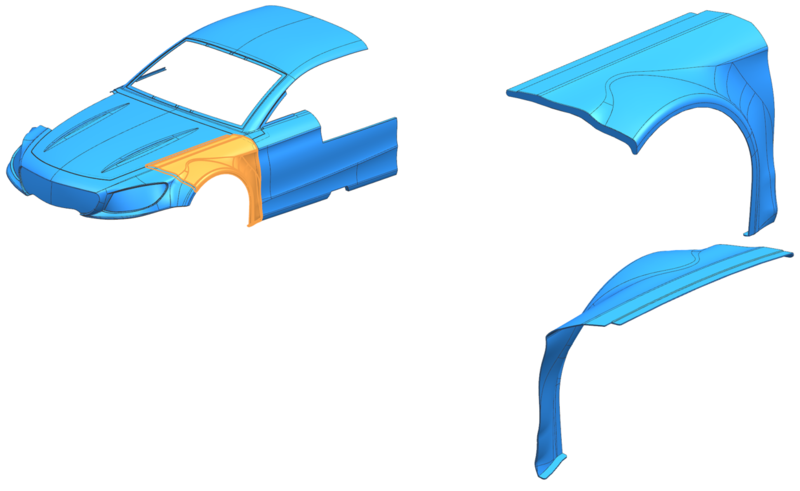 Flanges for assembling the cars are modeled, and it is examined for sharp edges, as it is an issue when molding fiberglass. The casting mold is modeled based on the particular part, in order for it to be prepared for infusion molding. The biggest challenge has been to identify the most optimal positions for the flanged joints, and ensuring that the draft angles in the mold require as few mold parts as possible. For this challenge, the “Draft Analysis” function in NX is used, which enables the user to point out all surfaces on an object, and hereafter determine a direction of demolding. Color codes will show which surfaces that can or cannot be demolded correctly. This has made it possible to detect critical points during reviews. Next, as a final control before the release of files for milling of the molds, all parts are gathered and assembled in a 3D file. After this, STP files are exported and released for the production process. From the start, it was estimated that the windows would be 4mm acrylic windows. Again, a CAD file is created for each window, which is imported from the final design. Next, each window is adjusted, so that there is room for tolerances in the windows and the parts, and there is made a chamfer around the window, which matches a tiny, slant angle in the parts. 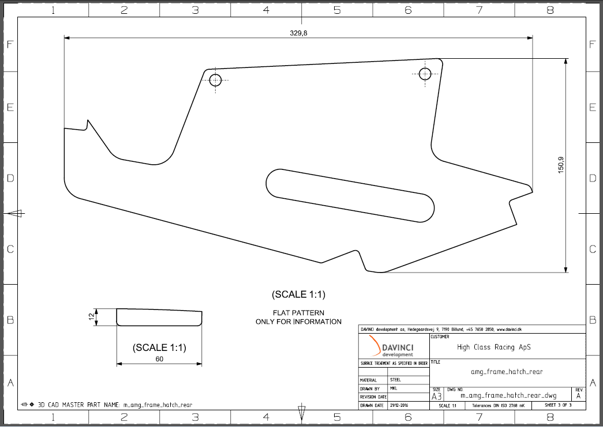 Following this, to form the basis of the DXF file, the windows are unfolded by creating a “flat pattern” in NX. Moreover, based on the 3D models, a 2D drawing is made, which describes hole sizes, mounting of tape, the beveled edges. Finally, a DXF file of the windows is exported. As described in the first article, a tubular frame was 3D scanned along with the cars. The tubular structure is modeled with all the interfaces that were allowed. Afterwards, the assembled chassis is put on top of the tubular frame, in NX. With this approach, it is possible to easily model the brackets and frames that are used to keep the parts in place. One of the biggest challenges here, has been to adjust the frames for the front and rear bumpers to the double-curved surface, without too much increase in manufacturing costs. To deal with this issue, focus has been on where to rivet the parts onto the tubular frame, to ensure that the parts and the frame touch on these particular points. From the beginning, it was decided that the parts were to be manufactured in fiberglass, via an infusion method. This method starts with placing fiberglass mats in the mold, and then making an airtight sealing with a plastic sheet. The purpose of this is to create a vacuum in the mold, where polyester resin is infused into the mats. Polyester along with the hardener soaks the fiberglass mats and binds the mats together when it is cured. The laminate descriptions tell the supplier how and where the different layers and types of mats are placed, where they must be reinforced, where possible brackets should be cast into the part, and where the parts should be cut and trimmed, after curing and demolding. Because the weight means a lot to the end user, the type and thickness of the fiberglass mats, as well as the reinforcements, are discussed with the supplier. The last step of the documentation package consists of installation instructions for all brackets, frames, windows and parts. This is described using illustrations imported from the CAD program.